Denny Law’s telecommunications company connects phone lines through the plains of western South Dakota and he’s all-in for ending the rural digital divide. He said President Donald Trump’s promise to level the playing field with a “great, great broadband,” made during a Jan. 8 speech in Nashville, Tennessee, has energized local providers like himself. And, he added, John Thune, the South Dakota Republican who chairs the Senate Commerce, Science and Transportation Committee, had better take note. “Put the money in the engine, and it can take off,” said Law, the CEO of the Golden West Telecommunications Cooperative in Wall, South Dakota. Washington is looking for ways to hook up high-speed broadband to more than 20 million people in rural areas. An investment of $40 billion would mean reaching about 90 percent of them, according to Paul de Sa, a consultant and a former Federal Communications Commission planner. At stake is the ability to receive business, job and educational tools that are part of daily life for most in urban and suburban areas. According to a 2014 study for the Agriculture Department, wired households had higher incomes and experienced fewer upticks in unemployment between 2001 and 2010, a period that included the Great Recession. “The states where a high proportion of rural households lack quality broadband — like Nebraska, Nevada and Arizona — are at risk of falling all further behind their urban counterparts in education, access to health care, income levels and jobs,” said Brian Whitacre, an agricultural economist at Oklahoma State University. Lawmakers are keeping their fingers crossed that Trump’s infrastructure proposal — long promised and still undelivered — will close some of the gap. Sens. Deb Fischer, a Nebraska Republican, and Joe Manchin III, a West Virginia Democrat, said rural broadband could take a portion of about $10 billion for rural nontransportation needs in a federal package that Trump has said could be $200 billion. “We’ve got to do more,” Manchin said. But Republican lawmakers, even as they wait to see whether Trump offers a plan, are simultaneously looking at other options, some of which involve legislation. “Keep expectations realistic and low,” Thune said, acknowledging the dicey prospects for an infrastructure bill amid a battle over budget priorities. Republicans, particularly those who, like Thune, represent rural voters, are trying to get broadband to remote areas even as they juggle sometimes conflicting goals: keeping the federal cost down, encouraging private sector investment, and doing so in a technology and regulatory environment that is itself changing and complicating choices. Whitacre said data speeds of about 10 megabits per second are sufficient for routine tasks like homework and downloading videos, but rural residents will need at least 25 Mbps for advanced services in the future, including remote health care and business applications like teleconferencing and data analysis. “We don’t want to disadvantage them by offering a lower standard,” he said. To get there, Republicans, backed by some Democrats, are calling for modest increases to federal subsidies. One approach, supported by a rural coalition from both parties, wants to upgrade the Agriculture Department’s Rural Utilities Service, or RUS, program that historically provides about $600 million a year in funding to build networks. Many lawmakers also support an increase in the $4 billion in annual high-cost operating subsidies financed by telephone bill fees. The subsidies help the providers get private loans. The FCC would decide where to direct those funds. In the best case scenario, supporters envision that a third of additional money would go to RUS and the rest would be channeled through the FCC through programs that aren’t solely aimed at rural broadband. Thune and Fischer, as well as other members in both chambers, said they hope Trump’s plan includes money, but they aren’t spelling out how much they’d like. The 2009 stimulus law included a $7 billion broadband pot, but just a third of it was specifically targeted to rural projects. Democrats have a more straightforward plan: spend $40 billion to connect homes still lacking broadband, mostly in rural areas. But except for the prospect of a broadband component in a Trump infrastructure bill, the Democrats have little chance of enacting their draft proposal, a plank in their Better Deal campaign agenda. Republicans have cheered the December decision by the FCC to reverse 2015 rules regarding net neutrality, a move that FCC Chairman Ajit Pai said would unleash investment in internet services in rural areas such as the one in southeastern Kansas where his parents live. For Galen Manners, president of Wave Wireless — with 2,500 customers including Pai’s parents — the end of the 2015 rules removes a “dark cloud” over investment in rural broadband. He said the FCC should now give him and other small operators a shot at bidding for census tract-sized licenses for a portion of the 150 megahertz spectrum of Citizens Band Radio Service, or CBRS— formerly used by the Defense Department — that will become available in coming months. With several such licenses, Manners said he could expand his footprint from one county to several in the Ozark foothills of southeastern Kansas, where it’s hard to lay wire and where he now relies on a blend of licensed and unlicensed spectrum. “We are very hopeful we will be able to bid on CBRS spectrum as long as it remains census tract-based,” Manners said. He said he hasn’t calculated the bid he’ll need to win each license, but he’ll have a better shot at a loan to cover network expansion costs after the FCC ruling. Manners’ optimism about the FCC’s net neutrality decision isn’t universal. Iowa’s Tom Miller is among 21 Democratic state attorneys general suing to stop the FCC decision. Miller said many rural customers in single-operator markets will be worse off. “That provider now gets to pick winners and losers by choosing what content you can load fast, slow, or not at all,” he said in a written statement on Jan. 16. Republicans, meanwhile, aim to free up spectrum space for various providers of wireless broadband, including giant mobile companies. The Senate has passed a bill by Thune that would make 255 MHz of spectrum available by 2020. The idea would be to sell nearly 40 percent, raising about $20 billion, to commercial mobile providers and hand over another 40 percent to small operators. That revenue calculation is based on the $19.8 billion raised from the FCC’s sale of 80 MHz last year. Another bipartisan proposal by Colorado Republican Sen. Cory Gardner calls for an unspecified amount of spectrum to be sold, and for earmarking 10 percent of the proceeds for unspecified rural broadband programs. House Energy and Commerce Chairman Greg Walden has been eyeing more than a dozen new bills from panel members aimed at streamlining state and local regulatory reviews and a requirement for broadband programs run by the Agriculture Department and the FCC to provide equal access to operators of wired networks and wireless broadband. The Oregon Republican said the measures could be attached to an infrastructure bill or other legislation. “It might be several bills,” he said. GOP Rep. Marsha Blackburn, who is running to succeed retiring Tennessee Republican Sen. Bob Corker, joined Trump on the platform in Nashville last month. She is pushing for a more flexible use of subsidies, including opening the high-cost program to all broadband providers. The subsidies are currently available only to providers that include a voice telephone option. West Virginia Republican Sen. Shelley Moore Capito said she hopes to promote a draft proposal that would give the FCC a broader role in overseeing federal rural broadband efforts while mapping the availability of service. Lawmakers are also watching software giant Microsoft, which said last July that it wants to partner this year with local providers in 12 states to use one of two unlicensed television channels in every market — dubbed white space and free for use without FCC approval — to deliver high-speed broadband service in rural communities. Microsoft has the project up and running in seven states so far. The response has been muted, however, among established providers focused on expanding their own systems rather than trying new technology. To woo providers, Microsoft has emphasized a report it commissioned by Boston Consulting Group that found the new approach costs one-fifth of a wired network, and half of a fixed wireless one, making it a cost-effective option in areas with two to 200 residents per square mile, representing about 80 percent of the underserved rural population. More isolated users would likely require links via other means, like satellites. Fred Humphries, a Microsoft corporate vice president and a former House Democratic leadership aide, said the FCC should allow a third unlicensed channel — for a total of three channels spanning 18 MHz overall — to help attract more investors and expedite expansion of rural broadband. He stopped short of saying whether Microsoft’s ability to develop its plan, called Airband, depends on the FCC granting the request. “All we are asking for is to partner with local providers and make sure that 18 MHz is available to bring broadband to the people in rural areas,” Humphries said in an interview. Roberto Gallardo, a researcher at Purdue University’s Center for Regional Development, said he agrees with Microsoft’s prediction that, regardless of what happens in Washington, about 2 million more rural residents will have high-speed links mainly from assorted wireless technologies, including the use of white space, by July 2022. But Dennis Wharton, an National Association of Broadcasters executive, rebuked Microsoft for trying to “demand free, unlicensed spectrum after refusing to bid on broadcast TV airwaves” in a spectrum auction last year. Mark Jamison, a visiting scholar at the American Enterprise Institute, said the Microsoft plan — whatever the motives — has injected a new dynamic in the rural marketplace: competition. “Tech companies benefit greatly from the expansion of broadband. If they are going to profit from it, why not have them also finance it?” Jamison said. Other companies are looking to provide faster wireless options via satellites, drones, high-altitude balloons or tethered blimps. AT&T has been working with Georgia Power on an AirGig project that would beam broadband over high-frequency airwaves that run along and around power lines. Thune and other lawmakers said they are intrigued by such actions, but aren’t offering targeted incentives or specific interventions with agencies. 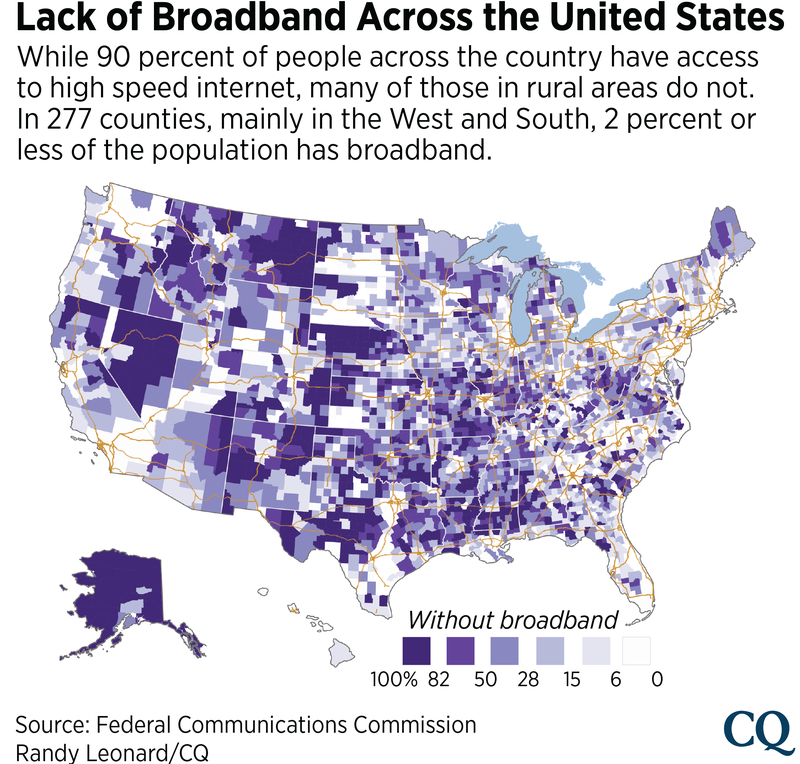 Part of the difficulty in setting federal policy is the underlying question of what quality of broadband is good enough and when can it be installed. The legislative and regulatory efforts to close the gap for rural America are taking place even as a new generation — 5G — threatens to widen the distance between the two. Thune and other Republicans are focused on 4G wireless networks and fixed lines to close the gap. The industry is meanwhile moving ahead on 5G, the fast and reliable wireless technology expected to enable driverless cars and remote medical care. Widespread use of the technology depends on so-called small cells, or nodes, every few hundred meters. Rural areas aren’t likely to have enough customers to meet the cost of such capital investment. But Peter Rysavy, an Oregon-based wireless consultant, predicted 5G will come to many rural areas by the 2020s and “reach significant penetration over the decade” with bigger cells several miles apart. With or without new subsidies, he said lawmakers should look for ways to expedite state and local zoning and land-use decisions related to wireless equipment and to standardize wireless deployment standards. “It’s the railroad of this century. It’s not going to happen unless you have a consistent and simplified process for deployment,” Rysavy said. California Gov. Jerry Brown vetoed a similar proposal in January in response to local officials’ complaints. In a Dec. 7 letter to Thune, the National Association of Counties, the National League of Cities and the U.S. Conference of Mayors criticized the bill as a “pre-emption of traditional local authority” and urged further talks. But Thune and Schatz are pushing forward.